The Highway Star — Bernie Tormé R.I.P. Another death in the Purple family. 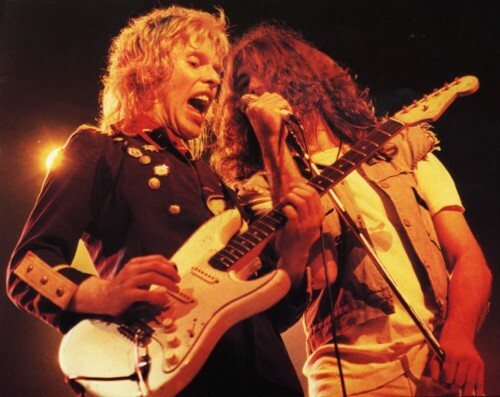 Former Gillan band guitar player Bernie Tormé has passed away on Sunday, March 17. Bernie Tormé passed away peacefully on the 17th March 2019, one day short of his 67th birthday, surrounded by his family. He had been on life support for the past four weeks at a London hospital following post-flu complications. Bernie will be remembered for dedicating his life to his music for five decades. He will be sorely missed. Last November, Tormé released a double album called Shadowland, which we somehow failed to mention at the time. Recorded last year at Barnroom Studios, the album was the first release from Bernie’s new trio. It also featured guest appearance from Colin Towns. Thanks to Blabbermouth for the sad news and to Jim Collins for the heads up. Posted by Nick Soveiko on Monday, March 18th, 2019, filed under News. You can follow comment on this post through the RSS 2.0 feed. You can skip to the end and leave a comment. Pinging is currently not allowed. What a sad day in Rock history. RIP Bernie, I have fond memories of his fiery performances in the early days of the Gillan band. That’s really sad news. I was a real fan of his work on the Gillan albums…May Bernie’s soul rest in Peace. RIP ;;Bernie Torme;; May your Light BURN ;;Forever–In Rock and Roll– Taste !!! Terribly sad news. Godspeed on your next journey Bernie. May he rest at peace. Saw Gillan live in Rome for the, first time in my life and Bernie was the lead guitarist. He played effortlessly. Rest in peace Bernie. So sad. One of my favourites. So sad. R.I.P. The Reaper’s roll call continues. Unfortunately, lots of us are at an age where our heroes ( musical & otherwise ) are passing on. May Bernie rest in peace. Sad news. Rest in peace. Poor fellow, he died in much the same way my mother did, of pneumonia. Bacteria gets into the lungs & weakens them, so they cannot function properly & requires a huge ventilator breathing tube through the mouth to feed oxygen to the lungs to prevent hypoxia. A feeding tube is hooked up to the patient, as a substitute to normal eating/drinking. Even without the breathing tube inserted, the ability to swallow, or gag reflex, is adversely affected, causing any food or drink to enter the lungs. Nobody wants to live what’s left of their life in a hospital bed in those circumstances. The great gods of rock and roll may pass but never die. They leave the human stage to rock the heavens forever. Till we rock again, farewell. I remember seeing Bernie’s first show with Ozzy at Madison Square Garden in New York. Randy had just died and being a big Gillan fan I knew he would do just fine and he was great. Even though he only did a handful of shows with Ozzy he was able to help keep the tour going. Rest in peace Bernie. By the way on a side note, UFO opened up for Ozzy on that tour supporting the Mechanix album. What a great night it was! Bernie provided the spark that truly re-ignited Ian G’s career. Mr Universe, Glory Road & Future Shock are bona fide British hard rock classics, sadly under appreciated. A unique guitar maestro & hero who brought a contemporary punk feel to the the early Gillan band without ever reducing the music to mere heavy metal. RIP Bernie Torme. I will always remember fondly the sunny afternoon with my girlfriend in the summer of 1980 in downtown Vancouver when I heard Gillan’s Glory Road album playing in the local record store. Listening to Bernie tear it up on the fretboard just bowled me over. I bought that album right away and played it numerous times over the weeks and months that followed. For me he ranked up there close to Blackmore – what a guitarist. Bernie was always humble and the most considerate Twitter friend . His quite charm masked a fine mind. Memories abide of his last gig at The Bellingham . May be beautiful laughings in Heaven dear Mr. Torme. Do rest in peace. Bernie took part of one of the best underrated bands of rock: SILVER (with Gary Barden e.a.). Their first album (Dream Machines) means much to me (https://www.youtube.com/watch?v=-QntT0nVu3Y). Would have been nice to have seen the Gillan band give it one more stint with this line-up, Where were you Ian? Torme was so underrated. Unfortunately never got o see him live. Well, heaven must be laughing now. I’m a fan of his GMT stuff, too. RIP Bernie.